Dear readers am back after a long time trying to complete what i started a few months back. This article is part 5 of the previous series but it doesn’t depend on the code of the previous articles, still they can be referenced to get a better understanding of configuring Google Maps for Android and learning the basic development of Google Maps for Android. The development environment stays the same as of the previous articles. No change in any of the configurations etc. Please see the links for previous articles for basics of Google Maps for Android. Objective of this article is to add multiple images to our Google Map Application for Android. I have taken a scenario where I have a list of coordinates of different cities of Pakistan and I want display an image on each city. Check the final output of this article so that you have an idea of what we will achieve at the end of this tutorial. Multiple Images Displayed on our Android Google Maps Application. Starting with the actual work, inside the main GoogleMapsAppActivity Class that extends MapActivity, add a Class lets say MirItemizedClass that extends ItemizedOverlay. This is a base class for an Overlay which consists of a list of OverlayItems. This handles sorting north-to-south for drawing, creating span bounds, drawing a marker for each point, and maintaining a focused item. It also matches screen-taps to items, and dispatches Focus-change events to an optional listener. We have to set the bounding rectangle of the drawable that we add to our ItemizedOverlay. The defaultMarker is a Drawable that is drawn on every OverlayItem that we add to our ItemizedOverlay. To do this we have to use boundCenterBottom or boundCenter or we can use the setBounds method to get the job done. So we have used boundCenterBottom(defaultMaker). To add multiple overlays we have added a List of OverlayItem and used that in the createItem and size methods of our ItemizedOverlay Class. To add the OverlayItems to our internal list we have added the method addOverlayItem(OverlayItem overlayItem). Now we will use the functionality of MirItemizedOverlay Class in the onCeate method of our main GoogleMapsAppActivity Class. We will create instances of Drawable and MirItemizedOverlay to retrieve the image from our res/drawable folder and to supply that image to the our ItemizedOverlay Class. We have also ceated a GeoPoint object with a latitude, longitude value. Add another method to our MirItemizedOverlay Class that will take two integers and a string as parameters. Now tweek the mapView to get focused at a certain point and set the zooming level. 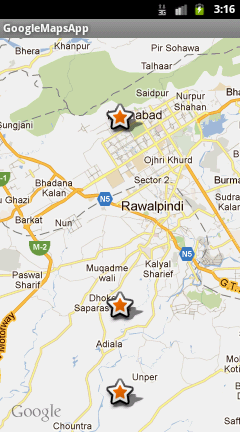 mc.setCenter(new GeoPoint(33580000, 73000000)); // Some where near Islamabad. Run the project we will get the output in the picture given above. Complete Code of this tutorial. I ll soon post for creating a Database, Tables and than saving information to those Tables and retrieving that information. Plz check back soon. I got it implemented onTap() method. in which par tap i get my class onDraw method to draw png resource on map and in onTap() method I implemented web-service which saves information in database and retrieve information in an other class which passes these coordinates to again onDraw method of that class. Thanks for posting me back. getApplicationContext is undefined , I did not find in your tutorial please guide me. Dear Mir. I have finished your code, it’s so great. But how to show address name above every location icon? I will wait for your post, but I still have a question. I wanna find the method to show a shortest direction road between two Geopoints (not a straight line). Can you show me some documents about this? 1st: Making all these classes part of the same file is smth mandatory in order to exploit the context of googleMapsActivity class? 2nd:My idea in the project is to search for 2 different locations of interest in the map. I want to create 2 diff markers for the various points and depending on what the user wants to search for , display the respective markers. IS this possible ? If yes , do I need 2 diff overlays or can i work with various methods? its not mandatory to make all classes part of the same file. but i have done it so that my readers can easily understand the idea and flow. u can display as many markers as u want and u don’t need 2 overlays, one is enough. secondly searching two location is possible if u have the coordinates. u can easily put markers on those coordinates. Dear Mir i apply your code in my computer its work but when i use it in my phone not show me the map why ?could you help me please. Check the android version than check the google Maps Api versions on ur phone and on ur emulator. secondly if the device loads the map but the screen is empty grid than that is a problem of Google Maps APi Key. Thank sir to answer me i Check my android version and the google Maps Api versions its same but the problem not show me the map just the star and if you ask me about android key i register it in Google map after get MD5 .what do you suggest to me I do. i hope if u follow each and everything exactly, it will solve ur issues. in data base i want to bottom search for any location for example write in this bottom Islamabad .the result show me just one star. With my best wishes . saving data on device in database or in flat files is a completely separate domain. the above series or articles only show the basics for google maps for android. i have written application on saving data in databases as well as in flat text files. but have not written tutorial for them yet. i ll try to publish their tutorial ASAP. I have a question about adding photos to google maps. How is it possible to add a photo which is sored on the phone to the map? I would be grateful for the link on methods how it is possible. Thank you. to add an image stored on the phone u need to follow the following article step by step. this article shows basics of adding images to google maps. I want the user to choose the photo from teh photos which are stored on the phone and to upload this chosen photo. In the tutorial there was this specific photo. Or am I mistaking? can i have two types of overlays 1 for my current location and the other of places ? and can i use sqlite to store the places? i have not used two overlays so far, but i think one can do the job than why use two. still u can give it a try and post ur experience under this thread so that every1 knows. secondly yes u can save the places in sqlite or simple comma seperated txt files or xml files. depends wat u will prefer and how u will retrieve data back from them. Good afternoon. Thanks for the tutorial, it works. Posdkazhite, please, is it possible somehow to add markers, if one is not aware of them? That eats create a variable, for example, the user will select a number of 5 or 10, and the show, or 5, or 10 markers. Is this possible? Hi , just I am wondering what benefit for this tutorial if anyone can add markers on google markers ,, still I have confused . can anyone tell me what is the different between them . Hi mir, This tutorial is very nice, i exctly looking for that kind of turorial, can we identifed which image is clicked on the map ! Thank You! can that image be an ImageButton and launch another activity? I want to draw a rote where the user is during trip,,,but I couldn’t find a way..So I will try to create the route according to the multiple cursor(make the cursor circle image or point) ..So I’ve included GPS ,So the emulator draws but not all times …Can you help me? I have my latitude and longitute in double, i have to multiply them for make it an integer or it will not work? why not parsing the figures. « Can’t find debug.keystore in .android folder. Issue Solved.